From 'Madhvacarya (Life and Teachings) by Bannanje Govindacarya. "Although he was mature in mind and on the other side of sixty by now, he had to face some opposition in his birthplace itself. A section of orthodoxy opposing his new message was still active. It was about this time that an Advaita ascetic, Pundarika-Puri by name, came to Udupi seeking a debate with the Acharya and had to go back in utter discomfiture. Meanwhile, a monk called Padmatirtha arranged for the theft of the rare library of the Acharya, kept in the custody of one Pejattaya Sankara Pandita in Kasaragodu. The Acharya took himself to Kasaragodu and defeated Padma-tirtha in a philosophical debate. The cream of the Acharya's thesis on that occasion was reduced to writing by the disciples. This itself became a treatise called Vada (lit 'thesis') or Tattvoddyota. Later on, Jayasimha of Kumble, the king of the Tulu region, invited the Acharya to his court and honored him by arranging for the return of his stolen library. 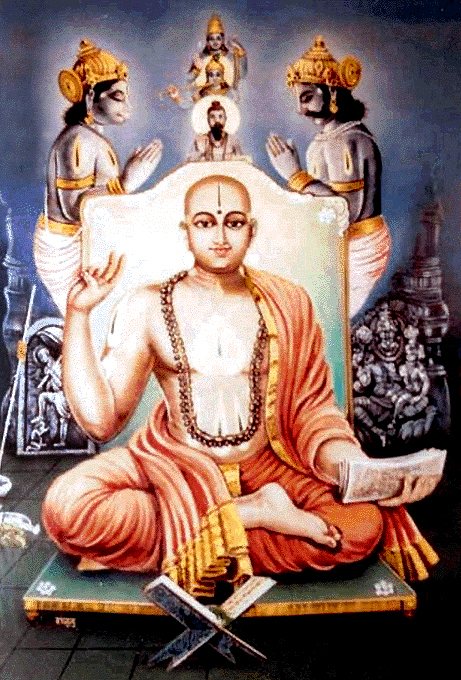 Pejattaya Trivikrama Panditacharya, who was the royal preceptor of the time, carried on a long debate with the Acharya for fifteen days and at last became his disciple, bowing down to the latter's greatness. He then wrote a matchless commentary called Tattva-dipika on the Acharya's Brahma-sutra-bhasya and thus paid his tribute to the guru. The Acharya too was equally fond of Trivikrama pandita. It was in answer to the request of this devoted pupil that the Acharya wrote an extensive commentary in verse, viz, Anu-vyakhyana on the Brahma-sutras. The Acharya was dictating this work to four disciples simultaneously, on each of the four chapters, without any break. At the same time, the composition of the work Nyayavivarana was also completed. Acharya Madhva completed his four-monthly stay (chaturmasya) at Kasaragodu and returned to Pajaka. There he initiated his brother into the monastic order, since he was longing for it with a deep sense of detachment. This was Sri Vishnutirtha, the first pontiff of the present day Sodematha and Subramanyamatha. About the same time, Sobhana-bhatta living on the bank of the Godavari also came to receive initiation into sannyasa from the Acharya. He became famous later on as Padmanabha-tirtha, the founder of the line of pontiffs in Desastha-mathas. When Padmanabha-tirtha was initiated into sannyasa is not definitely known. There were several who had got initiation before him. It appears that he should have been initiated into the order some time between the dates when these eight pontiffs were initiated into the order. The Acharya was now seventy. Even at this age, he toured all over the district and engaged himself in educating the general public. He composed for the benefit of a good natured Brahmin, Eda-Paditaya, in the village Idya, the literary work Krsnamrtamaharnava. Then he went on to Ujire and exposed there the spiritual aspect of ritualism in order to open the eyes of Brahmins who had faith in the ultimacy of rituals. This discourse itself came to be published later under the title of Khandartha-nimaya (Karmanimaya). Next he visited Panchalingesvara temple at Paranti, which he found in a dilapidated condition, without any worship or festivity. He made arrangements for the resumption of proper worship there according to the rituals prescribed by the ancient scriptures (agamas). The Acharya's life span of 79 years was thus one teeming with activity. When he thought that his life mission had been served, he put the responsibility of carrying on the tradition of this Tattvavada or philosophical thesis on the shoulders of his disciples and betook himself to Badri, all alone, without any thought or care. The day on which he thus proceeded to Badri was the ninth in the bright half of the month Magha in the Kali year 4418 (1317 CE). Even now, the anniversary of the Acharya is celebrated as Madhvanavami on the said day itself. The disciples of the Acharya, both pontifical and lay, continued this tradition with devout zeal. They nourished the young plant by supplying it constantly with the waters of their penance and erudition. Hundreds of dialectical treatises came to be written. Among the writers belonging to this school we may roughly classify some outstanding ones in the following chronological order: Vishnu-tirtha, Padmanabha-tirtha, Narahari-tirtha, Trivikrama-panditacharya, Narayana Panditacharya, Vamana-Panditacharya, (Traivikramaryadasa), Jayatirtha (Tikacharya), Vijayadhvaja-tirtha, Visnudasacharya, Vyasa-tirtha, Vadiraja, Vijayindra-tirtha, Raghavendra-Swamin, Yadupati-acharya, etc. It is a local custom to call the mathas after the names of villages where the original gifted properties of the matha are situated. Thus the matha which had its property in the village Palimaru is now called Palimaru-matha. The older name of the Sode-matha was Kumbhasi-matha. Later on, in the time of Vadiraja, when the matha was established at Sode in North Kanara, it became famous as Sode-matha. For the first four mathas the founder-pontiffs are the first four mentioned above, viz, from Padmanabha-tirtha to Aksobhya-tirtha. A traditional branch of Vyasaraya-matha itself came to be established at Kundapura in the district of South Kanara and came to be termed Kundapura-Vyasaraya-matha. Another branch of the matha founded by Padmanabha-tirtha became Mulubagilu-matha. Sripadaraja (alias Srilakshminarayana-tirtha) who was one of the pioneers of dasa-literature and the preceptor of Vyasa-tirtha was one of the illustrious pontiffs who illumined the tradition of this matha. The Subramanya-matha has grown out of Vishnu-tirtha's line itself. It is said that the line of disciples under the pontiff Acyuta-prajna, who in turn was the guru to initiate the Acharya into sannyasa, branched into two lines -- one at Bhandarkeri and the other at Bhimanakatte. Bhandarkeri is located some 20 Km north of Udupi in Barakuru. Though Bhimana-katte (Bhima-setumunivranda) is also a matha of Tulu region, its original sourcehead is a place called Bhimanakatte on the Tirthahalli-Shimoga road. According to folk-tradition, the Chitrapura-matha is only a branch of the Pejavara-matha. This matha is situated at Citrapura, some 35 Km. away from Udupi on the Udupi-Mangalore highway. The original locale of Gokarna-matha is Gokama. Later, pontiffs of this line started a matha in Parta-gali (Madagaum ... Mathagrama). After one of its celebrated pontiffs, Jivottama-tirtha, the matha also came to be called Jivottama-matha. According to the traditional list of pontiffs in this matha, its founder pontiff is reckoned as Sri Narayana-tirtha who had his initiation into sannyasa from Sri Ramachandra-tirtha, the tenth pontiff of palimaru-matha at Udupi. Though there is a branch-centre of Kasimatha in Kasi, it is originally a matha of the South only. Gauda Sarasvata Brahmins of the north coastal region stretching from Udupi up to Bombay are disciples of Gokamamatha. The Gauda Sarasvatas from Udupi up to Kanyakumari in the south are disciples of Kasi-matha. The Madhva-Gaudiya-matha is a Madhva religious center in Bengal. One of its branches existed also in what is now Bangladesh. A temple of Acharya Madhva also existed there. The International Hare Krishna pantha is an outgrowth of this.